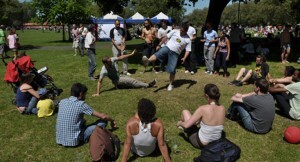 Tim has been following the East London Capoeira philosophy now for about 10 years. I (Master Fantasma) feel that Tim has passed many personal challenges to get to play capoeira the way he does today. I recognise this because i had similar difficulties. I have also noticed that the best teachers are often the ones that struggled most learning. Tim has amerced himself in capoeira and now supports the group as a performer, teacher and capoeira percussion player.